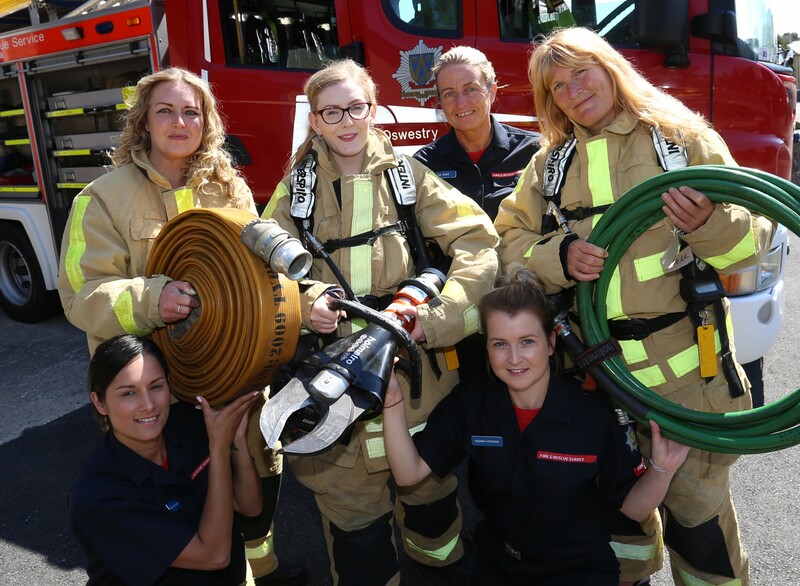 Women interested in a career as firefighters’ attended a successful taster session at Oswestry Fire Station aimed at encouraging more to join Shropshire Fire and Rescue Service. During the session they toured the fire station, checked out the equipment aboard fire appliances, tried on fire kit and experienced wearing breathing apparatus under instruction from firefighters. The visitors talked to female firefighters from stations at Prees, Albrighton and Wem. There are 26 women firefighters in Shropshire, eight in wholetime roles in Shrewsbury, Telford and Wellington and 18 on call from the county’s rural stations. But Shropshire Fire and Rescue Service want to encourage more to join what is often seen as a male career. “It was a very successful event attended by eight women who were interested in joining the fire service at various stations across the county,” said Watch Manager Phil Davies. The session covered training, development and support and promotion opportunities in a career as an on call firefighter. It also detailed the wide variety of incidents attended by firefighters including fires, floods, road traffic crashes, animal rescues, building collapses and any other major incidents. Other duties include fire safety education in schools and the home and attending community events to reduce fires and injuries as well as charitable work. “We also talked about the benefits to the community and to employers who allow their staff to leave work at a moment’s notice to answer an emergency call. “There is a sense of achievement, confidence building and new friendships they gain when joining the fire service,” added Phil. A total of 80 per cent of Shropshire’s firefightersare “on call” and turn out in an emergency to protect their local communities. Firefighters are physically fit and highly trained and attend weekly training sessions to keep their skills up to date.